It all starts right here. 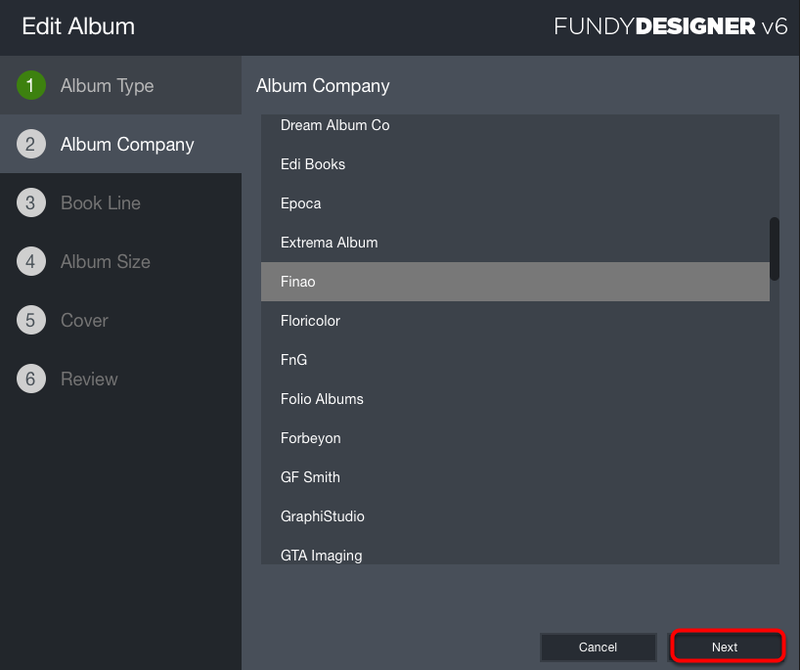 These next few lessons will go over how to create and set up a new project in Album Builder. Note: You can save yourself a lot of future frustration if all of your project files are located in the same folder. Try to avoid folders with sub-folders. Also, make sure you avoid special characters in your file names and file path. Stick with numbers and letters! You can read more about best practices for filenaming in this article. 2. Design and Export: Choose between our 120+ labs. The lab specifications are provided to us by the labs, so you save time on entering your album specs! 3. Custom Size: Don't see your preferred lab listed? Just enter a custom size. You'll be taken to the Edit Album Wizard (see below). Labs are listed in alphabetical order. Scroll and select your preferred album company, then click Next. Don't see your favorite lab? 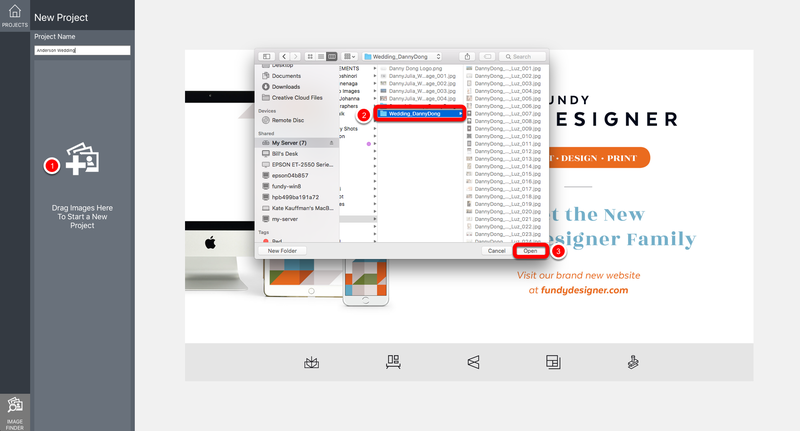 You can always go back and create a custom size by clicking step one. Select your book line in step 3. If your book line is blank, this could be the result of your software being out of date, or your internet connection is being blocked by firewall software. 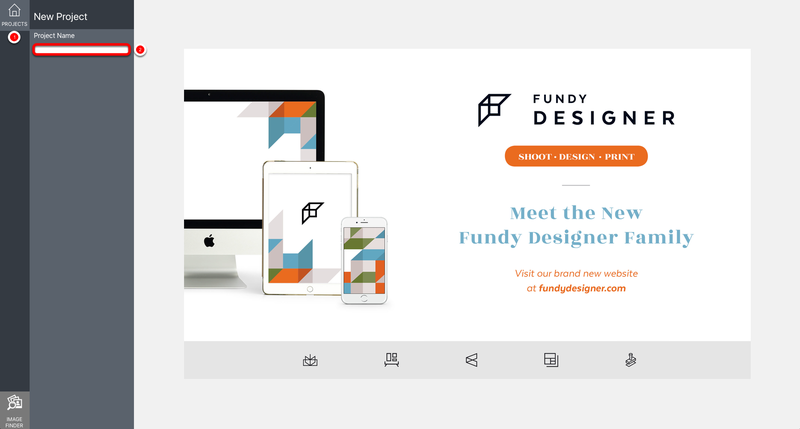 Double check your permissions settings to allow Fundy Designer to connect and this will be corrected. You can also go to the Help menu and select "Update Print Size Library". Once you select your book line, click Next. 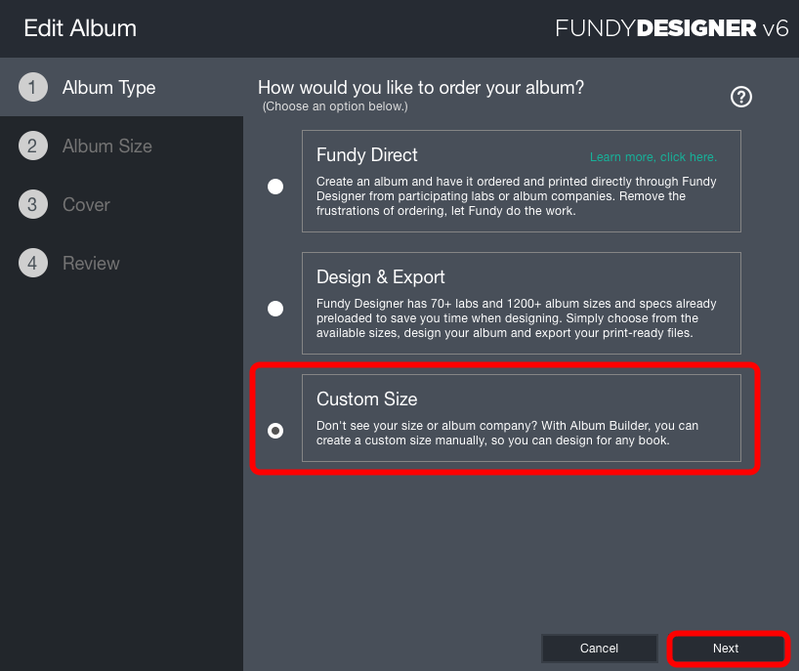 Choose your album size in step 4. Once you make your selection, click Next. In step 5, you have the option to add a cover. You can create a custom cover, or bring in a JPEG cover template from your album company and then design your cover in the software. Make your selection and click Next. 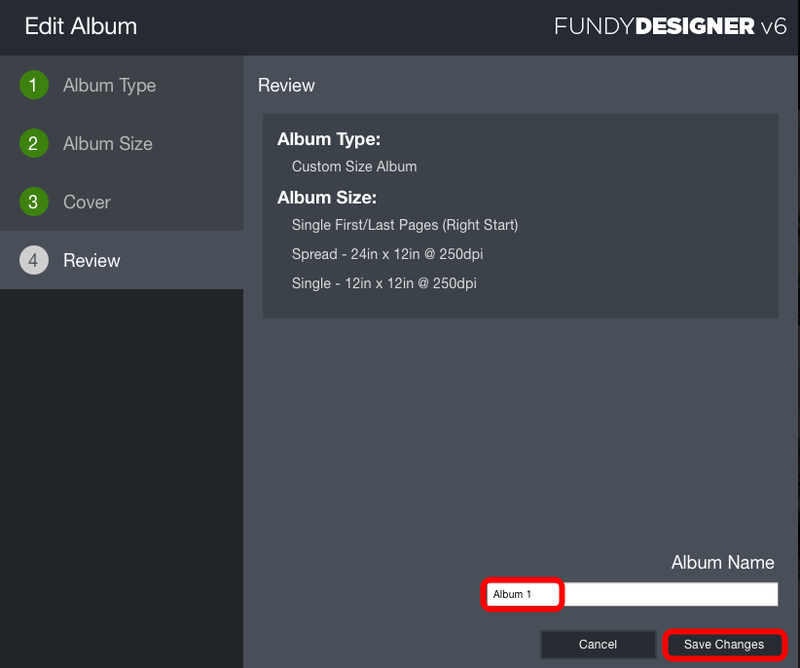 In the final step, you will review your album specs and name your album. You can go back to any previous step simply by clicking on that step. If your album looks correct, click Save Changes. 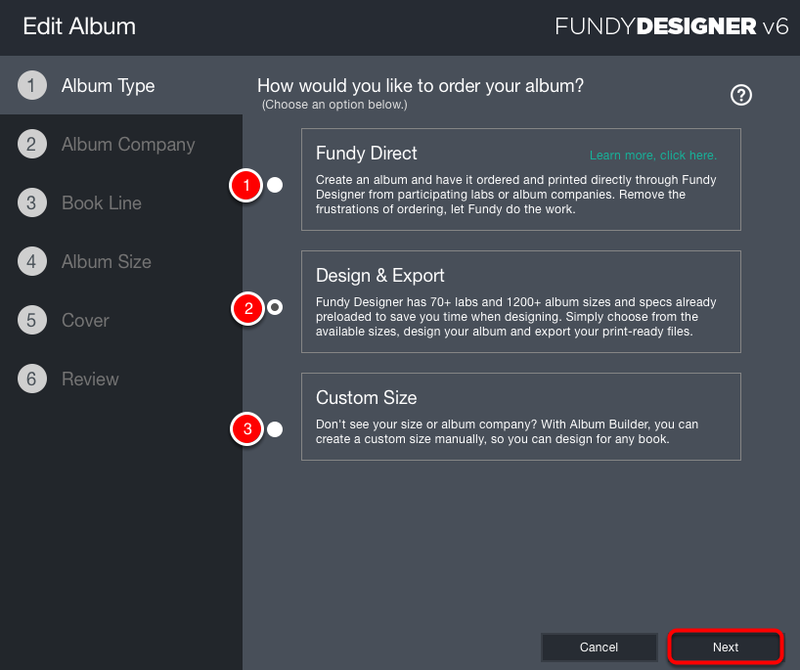 Your album is now set up and you are ready to start designing! Some album companies offer books that start both as spreads or single first/last pages. We default to their preference. 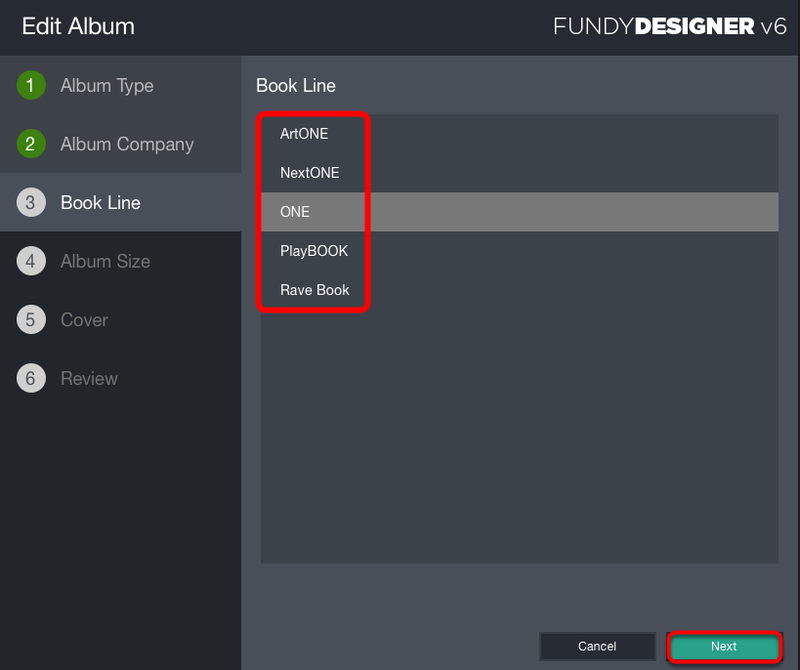 If you need to customize your album (add a single first/last page) or design to specifications for an album line that is not in our database, choose "Click here to customize this album size". This will take you to Step 2 of the Edit Album Wizard (see below). All your album settings will be retained and pre-populated in the Edit Album Wizard. 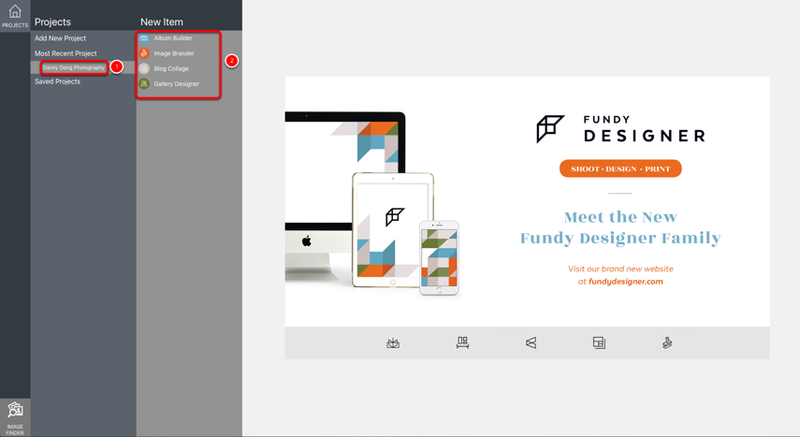 If you'd like to create a custom size, you can do this by selecting Custom Size, then you can input your custom dimensions and options. Note: You should check with your album company and verify you're inputting the correct dimensions and DPI for the specific album. 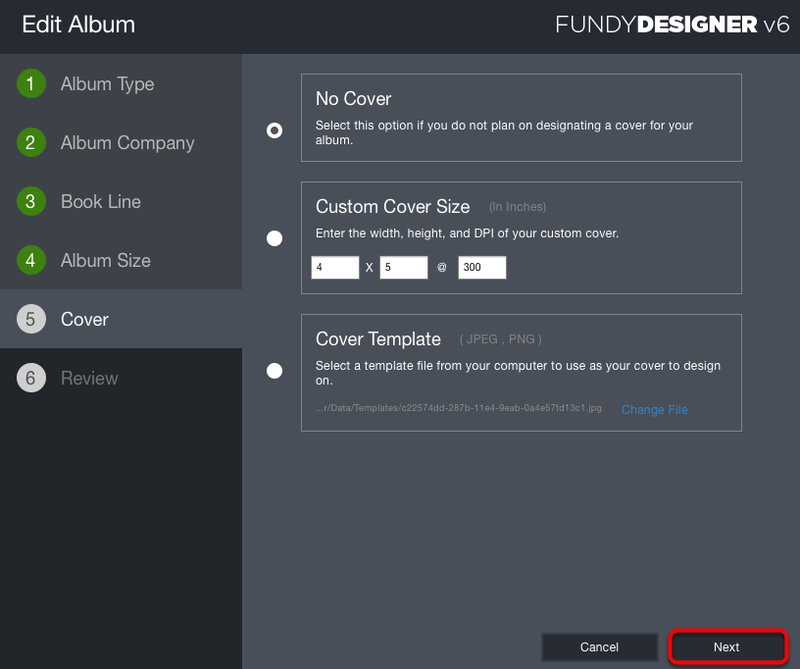 Also, in order to add or remove single first/last pages, you'll need to create a custom album. 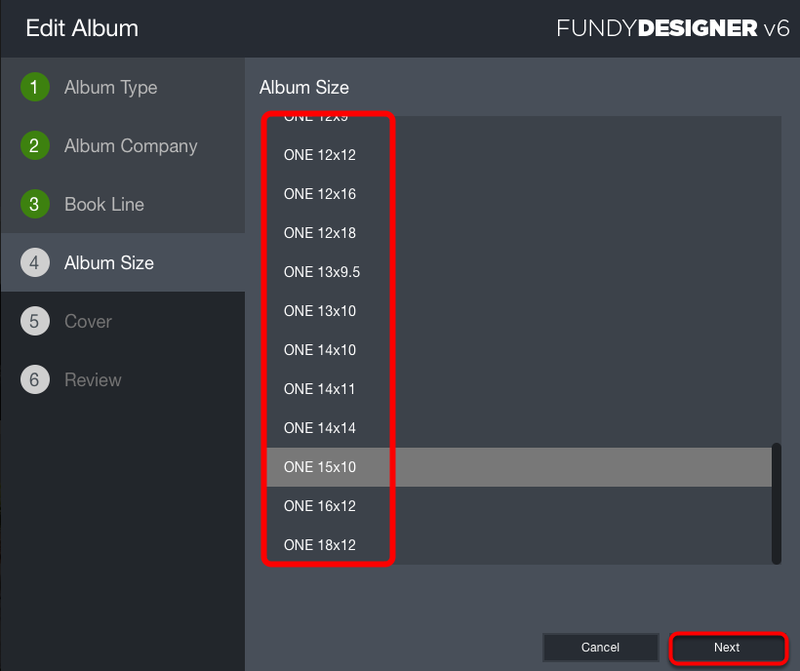 When you set up an album's spread size, you must ensure you're doubling your album's width to design as a spread. For Example: 5 x 4 inch album would be 10 x 4 inch spread (upon export you'll have the option to split the pages in half if you need to submit single pages). 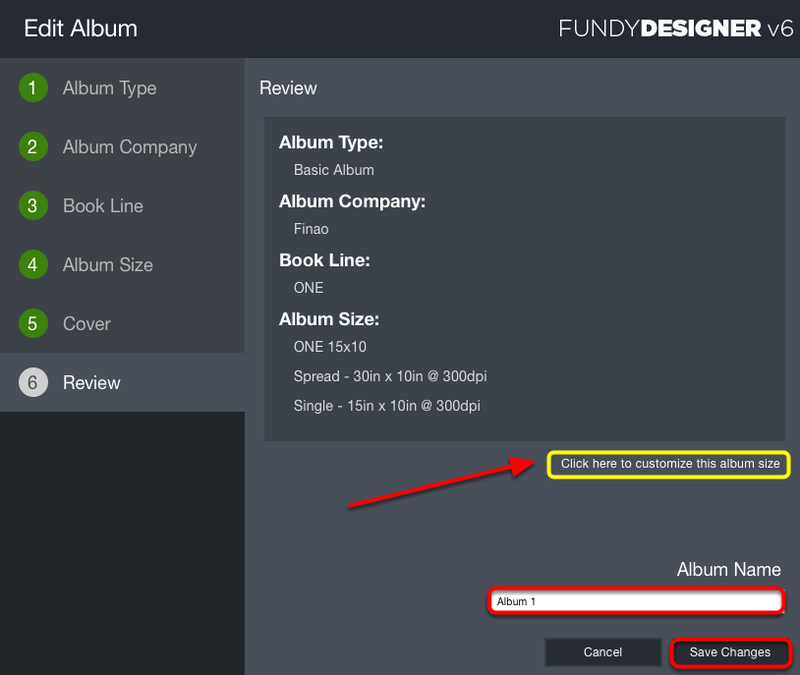 Review your album size and DPI. If you need to make changes, you can go to a previous step at any time by clicking on that step. 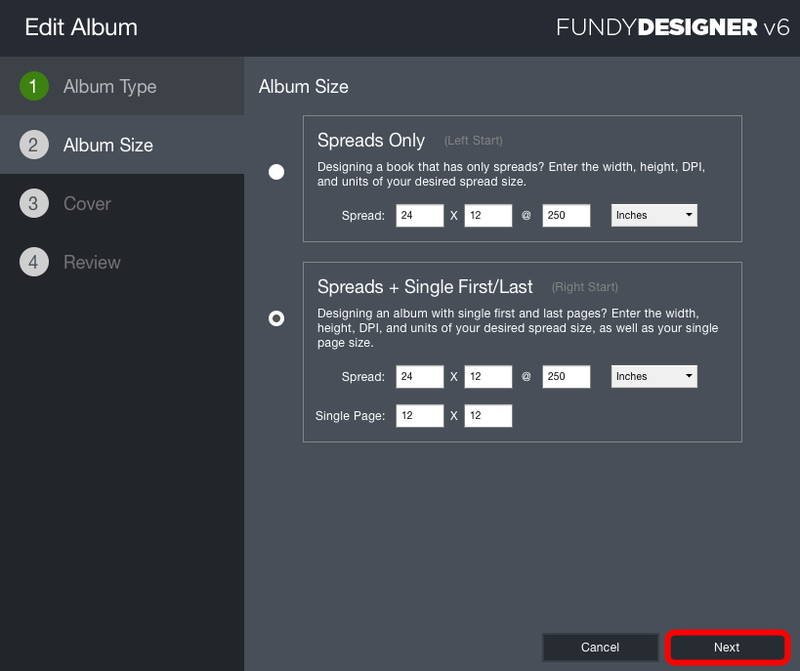 Once you are ready to proceed with designing, name your album, then click Save Changes. 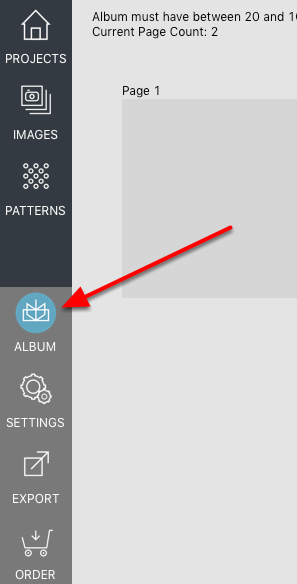 To change or modify your album size or lab, click on the album icon. This will take you to the Album Wizard.